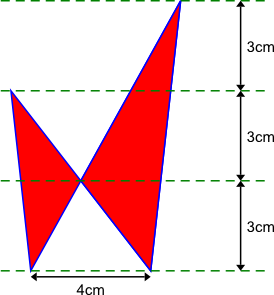 Determine the total area of the two kissing triangles shaded red. Is there more than one way of drawing the shape? Mathematical reasoning & proof. Pythagoras' theorem. Similarity and congruence. Triangles. Visualising. Angle properties of polygons. Area - triangles, quadrilaterals, compound shapes. Generalising. Quadrilaterals. 2D shapes and their properties.